Thailand was invaded by Japan during World War II in the 1941 invasion. At the start of the Pacific War, the Japanese Empire leaned on the Thais to allow passage of Japanese troops on their way to invade British-held Malaya and Burma. This was not popular with much of the population, but the Thai government under Plaek Phibunsongkhram (known simply as Phibun) thought it preferable to outright Japanese conquest. After Thailand agreed to let Japanese troops pass through the country, the Japanese then allied with Thailand and later Thailand declared war on the Allies. 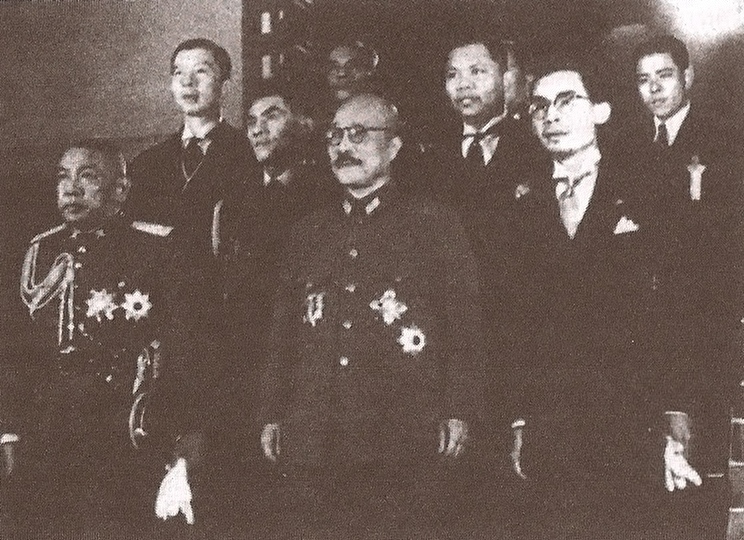 Thailand was still in control of its armed forces and internal affairs, however, the Japanese desired a bilateral relationship substantially similar to that existing with the puppet state of Manchukuo, which meant that bilateral relations between the two countries were rarely mutually beneficial. Ultimately, the primary aim was to ensure the resolution of Thailand's sovereignty and establish an independent nation that would be regarded as an equal by the Allies. A well-organised resistance movement numbered around 90,000 Thai guerrillas, supported by many government officials allied to the regent Pridi Phanomyong, was active from 1942 on to fight the Japanese. The partisans provided invaluable espionage services for the Allies, as well as performing some sabotage, and in 1944 helped engineer Phibun's downfall. After the war, however, Thailand still received little punishment for its wartime role under Phibun. At the start of World War II, Thailand was ruled by an authoritarian government dominated by a group of civil servants and military officers. Its prime minister was Plaek Phibunsongkhram, an army officer who shared many of his countrymen's admiration of fascism and the rapid pace of national development it seemed to afford. Consequently, Phibun cultivated and intensified militarism and nationalism while simultaneously building up a cult of personality using modern propaganda techniques. The regime also revived irredentist claims, stirring up anti-French sentiment and supporting restoration of former Thai territories in Cambodia and Laos. Seeking support against France, Phibun cultivated closer relations with Japan. Faced with American opposition and British hesitancy, Thailand looked to Japan for help in the confrontation with French Indochina. Although the Thai were united in their demand for the return of the lost provinces, Phibun's enthusiasm for the Japanese was markedly greater than that of Pridi Phanomyong, and many old conservatives as well viewed the course of the prime minister's foreign policy with misgivings. Sporadic fighting between Thai and French forces broke out along Thailand's eastern frontier in October 1940, and culminated in an invasion of Laos and Cambodia in January 1941. Although French forces suffered badly on land, their navy managed to inflict a crushing defeat on the Thai main fleet at Koh Chang, prompting the Japanese to intervene to mediate the conflict. Japan used its influence with the Vichy regime in France to obtain concessions for Thailand. As a result, France agreed in March 1941 to cede 54,000 square kilometres of Laotian territory west of the Mekong and most of the Cambodian province of Battambang to Thailand, which changed its name to Phra Tabong Province. The recovery of this lost territory and the regime's apparent victory over a European colonial power greatly enhanced Phibun's reputation. But because Japan wanted to maintain both her working relationship with Vichy and the status quo, the Thais were forced to accept only a quarter of the territory that they had demanded, in addition to having to pay six million piastres as a concession to the French. Relations between Japan and Thailand subsequently cooled as a disappointed Phibun switched to courting the British and Americans in the hopes of warding off what he saw as an imminent Japanese invasion. On December 8, 1941, after several hours of fighting between Thai and Japanese troops, Thailand chose to accede to Japanese demands for access through the country for Japanese forces invading Burma and Malaya. Phibun assured the country that the Japanese action was pre-arranged with a sympathetic Thai government. Thailand during World War II. On December 21, 1941, a mutual offensive-defensive alliance pact between the two countries was signed The agreement, revised on December 30, gave the Japanese full access to Thai railways, roads, airfields, naval bases, warehouses, communications systems and barracks. To facilitate greater economic cooperation, Pridi was removed from the cabinet and offered a seat on the politically impotent Regency Council for the absent king, which he subsequently accepted. Later on, as a result of Japanese pressure, the Thai government declared war on Britain and the United States on January 25, 1942. The Japanese also invited Thailand to signed the treaty alongside with the Axis Power unofficially with Manchukuo and Wang Jingwei's Reorganized National Government of China. This the Thais, who loathed the idea of being treated on the same level as the two puppet regimes, initially resisted, but ultimately the Japanese had their way. Thai resentment on this issue lasted throughout the war, however, and resulted in Phibun refusing to attend the following year's Greater East Asia Conference. Thailand was rewarded for Phibun's close cooperation with Japan during the early years of war with the return of further territory that had once been under Bangkok's control, namely the four northernmost Malay states. In addition, the Thai Phayap Army was permitted to invade and annex the north-eastern Shan States of Burma. Japan meanwhile had stationed 150,000 troops on Thai soil and built the infamous Death Railway through Thailand using Asian labourers and Allied prisoners of war. Although the majority of Thais were initially "intoxicated" with Japan's string of brilliant victories in early 1942, by the end of the year there was widespread resentment as a result of arrogant Japanese behaviour and war-induced economic problems. Even during the early stages of the war there was friction over issues such as the confiscation of Allied property and economic and monetary matters, as well as the treatment of Thailand's ethnic Chinese community. A vicious contest for saw mills and teak logs owned by British companies erupted early on, followed by similar disputes over the control of enemy energy and shipping facilities within the country. Other problems were more severe. For a time Germany continued actively purchasing local products, but once shipping difficulties became unsolvable, Japan became Thailand's sole significant trading partner. Similarly, Thailand had to rely on the Japanese for consumer goods previously imported from Europe and the United States, which Japan was increasingly unable to provide as the war wore on. A shortage of commodities quickly developed, with inflation soaring and standards of living dropping. Worse still, the Japanese had aggressively claimed the right to import goods duty-free, significantly reducing the Thai government's revenues. Things came to a head in December 1942 when an armed confrontation between Japanese troops and Thai villagers and police escalated into a shoot-out in Ratchaburi. Although the Ban Pong incident was promptly and peacefully resolved, it served as "a warning signal that alerted Tokyo to the seriousness of the problems in Thailand". This led to General Aketo Nakamura being sent to command the newly formed Thailand Garrison Army. Nakamura's ability to understand the Thai perspective, combined with his affable personality, significantly helped to improve Thai-Japanese relations. This more conciliatory stance occurred at a moment when the tide began to turn against Japan, something which many within the Thai government recognised. Realising that the Allies had seized the initiative in the war, Phibun, well aware of the troublesome personal predicament his relationship with Tokyo had put him in, started distancing himself from the Japanese. In January 1943 he had two of the Phayap Army's divisional commanders arrange the return of a group of Chinese prisoners-of-war as a gesture of friendship designed to open secret negotiations with Chungking. But the prime minister's star was waning at a much faster rate than he had thought. With the Allies intensifying their bombing raids on Bangkok, public confidence in Phibun, already tested by his idiosyncratic domestic policies, was sagging fast. His frequent absence from Bangkok led morale to plummet, while a sudden proclamation that the capital and its inhabitants be immediately moved north to malaria-infested Phetchabun was greeted with near-universal bemusement and discontent. And it wasn't only the public. The kingdom's ruling elite too was becoming increasingly weary of Phibun, whose intimidation and demotion of dissenters within the government served to further unite his opponents, who were gathering around Pridi. Even the Japanese were becoming disaffected with Phibun. That a military scheme lay behind Phibun's attempt to relocate the seat of government certainly wasn't lost on the Japanese. Remote, with the nearest rail connection being at Phitsanulok, a half-day's drive away, Phetchabun's main asset was its suitability as a mountainous fortress; moreover, the site was located in a region where the majority of the Thai army was based. Coinciding with the beginnings of Phibun's efforts to distance himself – through prolonged trips to the provinces – from the Japanese was the downfall of Benito Mussolini in Italy, an event which sent shock waves throughout the Thai elite, to the point that an emergency cabinet meeting was convened to discuss the European war situation. Analogies with Italy were soon being made by many: while "Badoglio" became an increasingly popular Thai political epithet, the Japanese envoy in Berlin was advised by Reichsmarschall Göring to keep a close watch on the Thai, lest they turn into an "Oriental Italy." However, in spite of increasing domestic discontent and Japanese distrust, it would not be until the following year that Phibun's political demise would come. While the Thai ambassador in London delivered Thailand's declaration of war to the British government, the Thai ambassador in Washington DC, Seni Pramoj, refused to do so. Accordingly, the United States refrained from declaring war on Thailand. With American assistance, Seni, a conservative aristocrat whose anti-Japanese credentials were well established, organised the Free Thai Movement, recruiting Thai students in the United States to work with the United States Office of Strategic Services (OSS). That Seni was able to achieve this was due to the State Department's decision to act as if Seni continued to represent Thailand, which enabled him to draw on Thai assets frozen by the United States. Despite the reciprocal British declaration of war, a parallel resistance movement was formed by the Thai in Britain. They were organised by two leading students, Snoh Tambuyen and Puey Ungphakorn, and were assisted by members of the self-exiled royal family, including Queen Ramphaiphanni, the widow of King Prajadhipok, and her brother, Prince Suphasawatwongsanit Sawatdiwat. From the office of the regent in Thailand, Pridi ran a clandestine movement that by the end of the war had with Allied aid armed more than 50,000 Thai to resist the Japanese occupation. In 1944 he managed to engineer the unseating of Phibun, who was replaced by Khuang Aphaiwong, the son of a minor nobleman and a civilian linked politically with conservatives like Seni. Khuang's main task was to continue the charade of collaboration whilst shielding the growing underground movement. This he succeeded to a great extent, convincing not only Nakamura but also the notorious Masanobu Tsuji. By the beginning of 1945, preparations were actively being pursued for a rising against the Japanese occupiers. Plans for an uprising relied on the success of a quick, surprise strike by a special police unit against the Japanese command structure. The residences of leading officers and the Japanese communications facilities were kept under surveillance. The police assault was to be coordinated with a general attack by the partly mechanised Thai 1st Army against Japanese troops in Bangkok. Fortifications, in the guise of air raid shelters, had been dug at key crossroads, and additional troops had been brought into the city in small groups in civilian clothes. The task of Free Thai forces elsewhere would be to thwart Japanese efforts to reinforce their Bangkok garrison by cutting communications lines and seizing airfields. Pridi had to take into consideration that the Japanese were building up their forces in Thailand, which was likely to become a battlefront in the near future. Previously most Japanese soldiers stationed in Thailand had been support troops, but in December 1944 the local command had been upgraded from garrison status to a field army. The Japanese were gathering supplies and constructing fortifications for a last-ditch defensive effort at Nakhon Nayok, about 100 kilometres north-east of Bangkok. The atomic bombings and subsequent Japanese surrender precluded the uprising, however. Pridi immediately issued a declaration stating that Phibun's 1942 declaration of war was unconstitutional and legally void, thereby dispensing any need for Thailand to surrender. The Thai armed forces initially attempted to disarm the Japanese garrison, but Nakamura refused, arguing that the matter was for the Allies to decide. Khuang in the meanwhile resigned, citing his previous association with the Japanese as a possible obstacle to Thailand's rapprochement with the Allies. A caretaker premier was found in the person of Tawee Boonyaket, a Pridi loyalist. In early September the leading elements of Major-General Geoffrey Charles Evans's Indian 7th Infantry Division landed, accompanied by Edwina Mountbatten. Later that month Seni returned from Washington to succeed Tawee as prime minister. It was the first time in over a decade that the government was controlled by civilians. But the ensuing factional scramble for power in late 1945 created political divisions in the ranks of the civilian leaders that destroyed their potential for making a common stand against the resurgent political force of the military in the post-war years. Moreover, the post-war accommodations with the Allies weakened the civilian government. As a result of the contributions made to the Allied war efforts by the Free Thai Movement, the United States, which unlike the other Allies had never officially been at war with Thailand, refrained from dealing with Thailand as an enemy country in post-war peace negotiations. Before signing a peace treaty, however, Britain demanded war reparations in the form of rice shipments to Malaya. An Anglo-Thai Peace Treaty was signed on 1 January 1946. France refused to permit admission of Thailand to the United Nations until Indochinese territories annexed during the war were returned. The Soviet Union insisted on the repeal of anti-communist legislation. ↑ Jackson Travel Journal – Thailand: Bangkok. The-silk-route.co.uk. Retrieved on 2011-03-18. ↑ 2.00 2.01 2.02 2.03 2.04 2.05 2.06 2.07 2.08 2.09 2.10 2.11 2.12 2.13 2.14 2.15 2.16 2.17 2.18 2.19 E. Bruce Reynolds. (1994) Thailand and Japan's Southern Advance 1940–1945. St. Martin's Press ISBN 0-312-10402-2. ↑ Direk Jayanama. (2007) Thailand and WWII. Silkworm Books. ↑ John B. Haseman. (2002) The Thai Resistance Movement during World War II. Silkworm Books. ↑ Louis Allen. (1976) The End of the War in Asia. Beekman Books. ↑ Daniel Fineman. (1997) A Special Relation: The United States and Military Government in Thailand, 1947-1958. University of Hawaii Press.